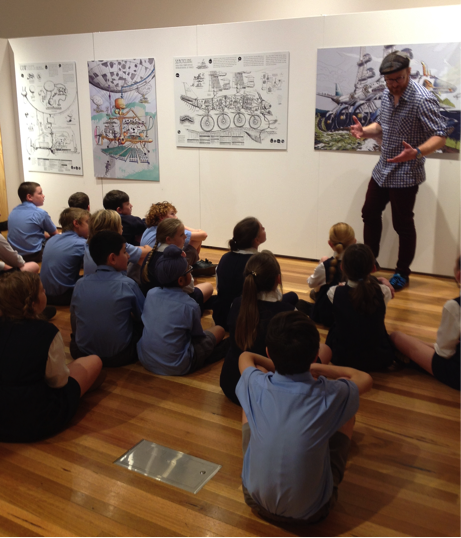 The second week of my new job, the 14th -16th September 2014 saw me in sunny Port Macquarie to observe Design Emergency and High School workshops in action as part of CUSP: Designing into the Next Decade. Day 1: Annette Maurer, myself and CUSP designers Stephen Mushin and George Knut worked with a grade 5 class from St Josephs Primary School on a Design Emergency challenge based on the kids treatment of the Koalas, Lizards and Birds in their school grounds. AWESOME challenge that our designers facilitated with eagerness and anticipation!! Kids were engaged the entire time and identified that collaboratively they can make changes to their school grounds. There were some clever, creative models made and unique systems planned for keeping the animals safe. Day 2: We lost George and gained Claire McCaughan for the High School workshops with three classes from Port Macquarie and Taree participating in prototyping imaginative designs of their future spaces… great fun and students were very inspired by Claire and Stephen’s talk about their work at the start of the workshop. So what’s next for me? Look out for our holiday collaborative workshops for kids… where kids get to design their own fun and games and learning is a side effect!